On this page, we are going to review The Ultimate Revenge Diet by Joanie Anderson. 1. A short section with some basic details about The Ultimate Revenge Diet. 2. An in-depth review of Joanie Anderson’s diet plan that will help you to understand much better if it is the right choice for you or not. 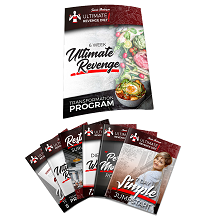 Created by Joanie Anderson, a mother, and weight loss specialist, the Ultimate Revenge Diet is a diet program that was specifically designed to help women lose weight, without stringent food restrictions, calorie counting, and spending hours in the gym. It doesn’t only promise to help you lose the extra pounds, but it may also help reverse type 2 diabetes and heart disease and slow down the effects of aging on your muscles, skin, and joint. lose a significant amount of weight. – Women have a harder time losing weight than men. – Spending hours in the gym doing cardio is the best way to lose fat. – Avoid eating foods that are rich in fat. 1. The “7 Day Simple Jumpstart” – In this report, you’ll discover the 3 rules that helped Joanie and other women lose weight, without starving themselves. There’s also a shopping list for affordable, tasty, and metabolism-boosting foods. 2. The “6 Week Ultimate Revenge Transformation Program” – This will tell you the exact things you need to do to lose weight in just six weeks. No need to go to the gym, deprive yourself of your favorite foods, and calorie counting. 3. The “Restaurant Survival Guide” – In this guide, Joanie will show you how to munch on restaurant or fast food meals while still losing weight. 4. The “Diet Tracking System” – With this, you can track what you eat and monitor your progress, so you can be 100 percent sure you’re still on track. 5. The “Perfect Morning Routine” – By following this routine, you can supercharge your body in the morning and chase away morning fogginess. Hint: It doesn’t involve any exercise. As what Joanie emphasized, this is not a stringent diet. You don’t have to feel sorry for yourself because you can’t eat the foods you want. This will teach you what to eat and how to eat—yes, including those burgers and fries—so you get the best possible results. Of course, this is not an excuse for you to stuff yourself with unhealthy food and drinks. You still need to pay attention to what you eat to maximize the benefits of this diet program. You could probably finish reading all the reports within a day, depending on how fast you read. There are no recipes that need hours to make, so if you keep a tight schedule, you’ll have no problem sticking to this diet program. Joanie also gave a shopping list, so you don’t have to spend so much time buying all the ingredients. In general, unless you have food allergies or a serious health problem, The Ultimate Revenge Diet is safe to follow. You don’t have to take risky weight loss pills and perform back-breaking exercises. So far, we haven’t encountered any safety complaints about it online. There are different factors that could influence the effectiveness of the Ultimate Revenge Diet program. Examples are genes, race, age, health status, social influences, and mindset, to name a few. Bad news for men who are interested to try this “revenge diet.” With that in mind, we think men could still benefit from this program. For example, they could get the useful techniques or points in the program, and then tweak them to suit their unique needs. While it may not work for them as good as for women, they may still find some of the concepts useful. Like most fitness programs sold online, The Ultimate Revenge Diet is an eBook in PDF format. If you don’t like reading eBooks, your only option is to print it yourself. We believe The Ultimate Revenge Diet is worth a look. This is probably more suitable for women who are relatively healthy and not severely overweight. If you want a simple yet effective way to diet for weight loss, if you want to avoid taking weight loss pills or spending hours in the gym, or if you’re a busy individual, then The Ultimate Revenge Diet is a great option for you to consider. It has its downsides, though. As with most diets, people will react differently to this diet program. Some may see significant results in a short time, while others may have to wait longer. So, always keep your expectations realistic. Be consistent with your efforts, and it wouldn’t hurt to exercise, too.